-Obstruction of lacrimal (tear ) canals is a pathologic obstruction of canals that discharge away tears from the eye through the nose and throat without feeling of the person. -Each eye has its own lacrimal system , which starts from the holes (punctums) present in the edges of the inner part of the upper and the lower eyelids. And from here two separate canals continue to share one common canal that discharges into the lacrimal sac and then to the lacrimal duct toward the nasal cavity. 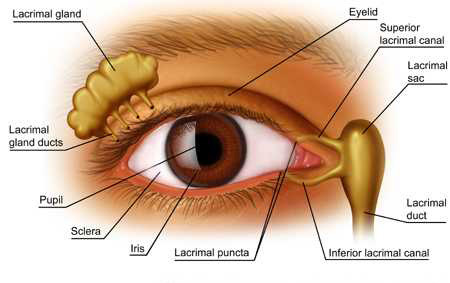 -Any obstruction along this canal system makes the tear not able to leave the eye by the normal route to the nose. So, eye begins tearing as if the patient is crying. -Sometimes, the lacrimal canal obstruction may be congenital, due to a fine membrane which is present inside the lacrimal canal. This causes continuous tearing to the child with accumulation of inflammatory secretions. However , canal obstruction may also occur later in life because of inflammation which causes fibrosis and obstruction of the canals. -Patients of this disease always suffer from continuous tearing , which is sometimes accompanied by secretions and swelling. Usually, this tearing increases in cold or windy weather. -Of course, not any eye tearing means obstruction of tear canals. For example, microbic or allergic eye inflammations, foreign body inside the eye, or some traumatic wounds all may cause tearing. That’s why it is important to be sure that tearing is because of lacrimal canal obstruction. This is performed by special tear canal films to check if there is obstruction or not and to know the level of this obstruction. Also, the diagnosis can be done by lacrimal lavage in which fluid is injected into the tear canal from the punctum and then follow if it reaches the nose or throat. -For the treatment, in the congenital cases , if the diagnosis has been done before one year of age, doing a certain massage and pressure over the lacrimal sac many times daily may be enough to open the canal. However , if the obstruction still persists till one year of age , probing of the lacrimal canal is performed under general anesthesia. 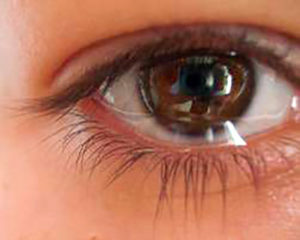 -For the lacrimal canal obstruction that occurs later in life, it can be treated only by a special surgical operation in which a new route is created between the lacrimal sac and nasal cavity , through which tears can leave the eye to the nose without any problems and the patient gets rid of tearing problems.